Neiman Marcus is a privately held retail chain based in the U.S. Everything you ever wanted to know - and other information you didn't know to ask - about the Neiman Marcus Group and their retailing legacy is included in this retail industry profile. Find the Neiman Marcus mission statement, and research all the relevant (and irrelevant) information that has made Neiman Marcus one of the greatest long-standing retail chains in U.S. retail history. “Neiman Marcus Stores will be the premier luxury retailer recognized for merchandise leadership and superior customer service. We will offer the finest fashion and quality products in an exceptional environment." Before opening the first Neiman Marcus store, the founding team turned down an opportunity to purchase a franchise selling an obscure fountain drink called Coca-Cola. Stanley Marcus (son of founder Herbert Marcus) created the Neiman Marcus Award for Distinguished Service in the Field of Fashion, which is presented to fashion designers who influence the direction of the fashion industry. Neiman Marcus had the first customer loyalty program (InCircle), and the first in-store gift-wrapping service. Neiman Marcus was reportedly designer Coco Chanel's favorite place to shop. 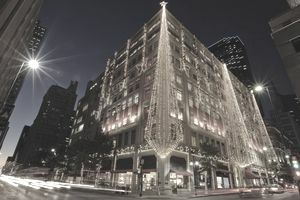 The first Neiman Marcus store was opened in 1907 in Dallas Texas. The company was founded by Herbert Marcus, his sister, Carrie Marcus Neiman, and his brother-in-law, Al Neiman. Their initial investment was $25,000. The Bergdorf Goodman flagship store opened in 1901 in New York City. That company was founded by Herman Bergdorf in 1899 as a tailor shop. That tailor shop was purchased by Edwin Goodman in 1906 and the business started evolving to the luxury retailer it is today. Carter Hawley Hale Stores acquired Neiman Marcus in 1969 and Bergdorf Goodman in 1972. Neiman-Marcus Group, Inc. was split off in 1987. Square footage for all Bergdorf Goodman and Neiman Marcus stores totals 316,000 square feet, as of March 2008. Bergdorf Goodman was the first retailer to introduce ready-to-wear clothes, as an alternative to custom-made, tailored clothes. When the Bergdorf Goodman building on 5th Avenue was originally built, it included a 9th-floor residence for the Goodman family. This was converted into a day spa and salon in 1997. The Neiman Marcus world famous "Christmas Book" first appeared in 1926. Fantasy gifts offered through the mail order catalog have included Texas Stadium artificial end zone turf, a zeppelin, a personalized jetliner, and his-and-hers adult-size robots. The Neiman Marcus Group retails high end and luxury apparel, shoes, accessories, jewelry, cosmetics, furnishings, antiques, rare books, and decorative home items. Its target market is consumers who are in the top 2% of the income bracket in the U.S. and equally wealthy people around the world. According to the company's website, its average customer has an advanced degree, is well-traveled and sophisticated. Neiman Marcus Group, Inc. retails upscale merchandise through its Specialty Retail Stores segment and its Direct Marketing segment. Its specialty retail stores segment includes Neiman Marcus stores, Bergdorf Goodman stores, and Horchow stores. It's direct marketing segment consists of the world famous Neiman Marcus Christmas Book catalog, and the Horchow Home catalog, as well as e-commerce websites for Neiman Marcus, Bergdorf Goodman, and Horchow. Strangely, one of the things that made Neiman Marcus legendary in the U.S. retail industry is an urban legend hoax about Neiman Marcus chocolate chip cookies. In the 1980's a story about a Neiman Marcus cookie recipe started circulating about a customer service failure incident that never happened, but because it became so well known, it damaged the reputation of Neiman Marcus brand anyway. For those that missed it in the 1980's, here's the Neiman Marcus Chocolate Chip Cookie Recipe story... Supposedly a customer who was eating a chocolate chip cookie at the Dallas Neiman Marcus store asked the waiter for the recipe. The waiter informed her that he could give her the recipe, but there would be a "two-fifty" charge. When the woman received her VISA statement, she found a $250.00 charge, instead of the $2.50 charge she was expecting. As revenge, she then started telling the story and circulating the recipe for free. Neiman Marcus claims the story is completely untrue, pointing out that it had no chocolate chip recipe at the time the story started circulating, and that it also did not accept VISA as a form of payment in its stores. In response to the widespread rumor and the criticism they received from it, the company did create a chocolate cookie recipe, which it makes available at no charge. The Neiman Marcus $250 Cookie Recipe story is considered to be an urban legend. It was an early example of viral communication that was originally passed along via xerox copies. The legend gained even more notoriety as a popular viral e-mail message that readers were encouraged to forward to all their friends. Which Are The Largest U.S.-based Grocery and Retail Chains Are Largest in the World?